I went to California. You know how it’s really really hard to shut up about things that get you excited? Yep, this is going to be really really hard to keep short, but I’ll try. 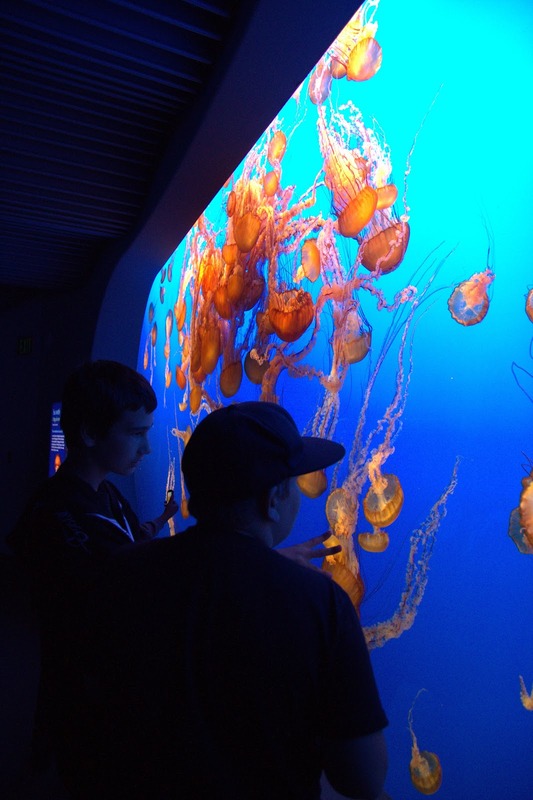 The Monterey Bay Aquarium was f***** amazing! Remembering the experience, one particular episode brings a crazy happy smile to my face. 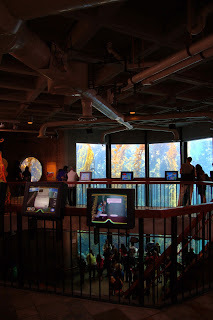 A tall guy in his 40’s stood with his daughter (about six years old or so) in front of the kelp forest tank. 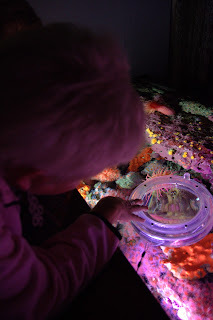 As she pointed at animals and algae in awe, he patiently answered her questions and discussed the information displayed on boards around the tank. When she pointed at a sea urchin, he asked what she thought the «purpose of those spiny things on top of it were»! SO pedagogic I almost went over to hug him. (- Yes, I’m getting soft… like creepy gooey soft…) As a shark passed in front of them, the little girl clung to his thigh. He smiled and held her hand as they watched the elegant creature glide by in silence. That moment of connection in curiosity and awe between generations was truly amazing to observe. From thereon, I started noticing people as well as the under-water displays. 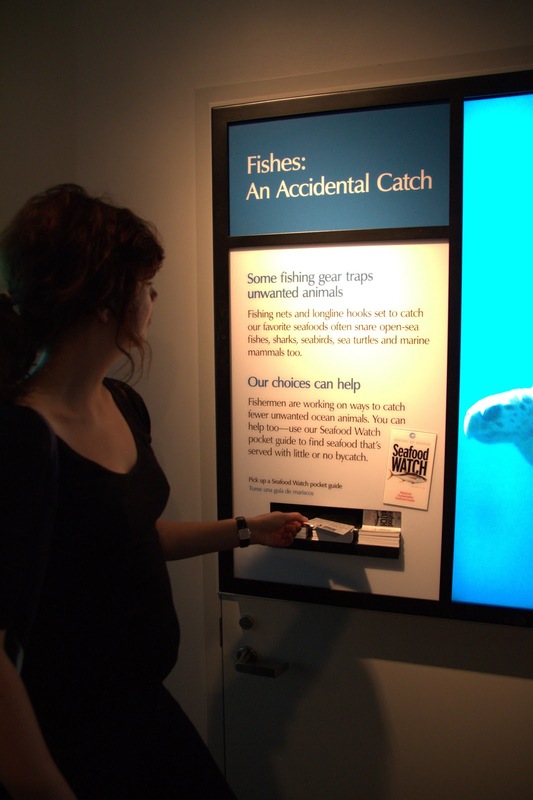 The faces of the different people gathering around the fish tanks, the tide pools, the informative posters and the interactive screens fascinated me. A woman in her 60’s stood a long time just staring at some strawberry anemones, smiling. A man, also in his 60’s went absolutely bananas with his digital compact camera pixellating all sorts of colorful fish. 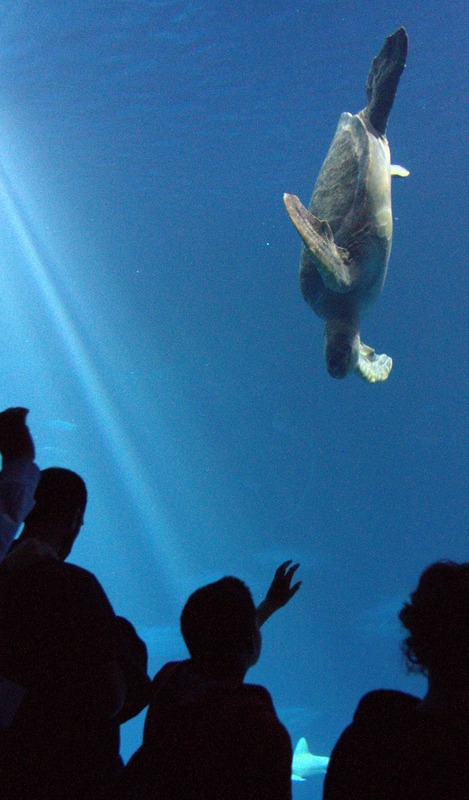 A group of teenage boys stood close to a huge tank where turtles and hammerhead sharks swam by. The boys stood in complete silence, reaching for the animals and exchanged smiles at the mere glimpse of contact. 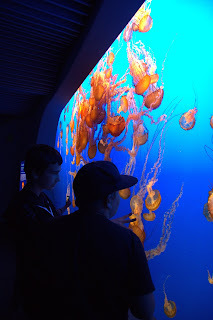 A couple of kids put their heads together by an interactive digital plankton display and were super-excited by the myriads of weird creatures. They were pointing, laughing and wondering about the different forms. I swear, I have never before seen anyone look so excited about those things, – not even in a bio lab. 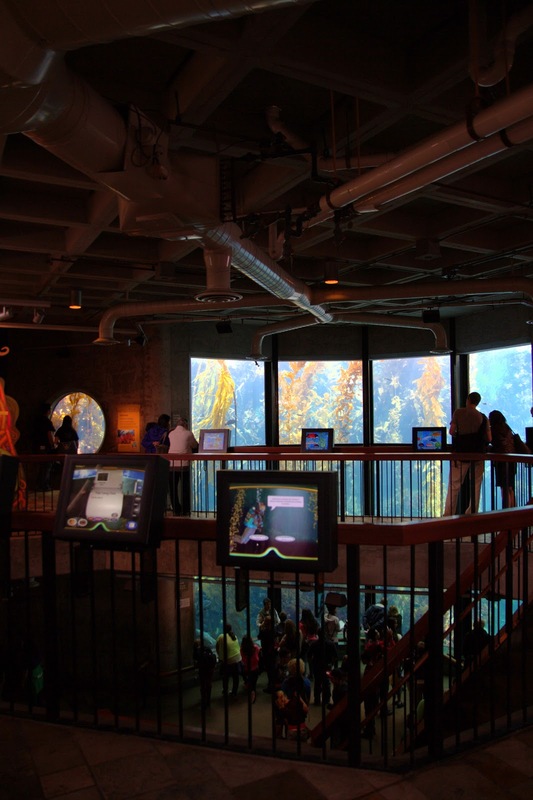 It seems to me like the Monterey Bay Aquarium makes it easy for the general public (and not only for two excited marine biologists from Norway) to really invest emotionally and intellectually in the exploration of marine life. To quote the legendary Jacques-Yves Cousteau: «People protect what they love». 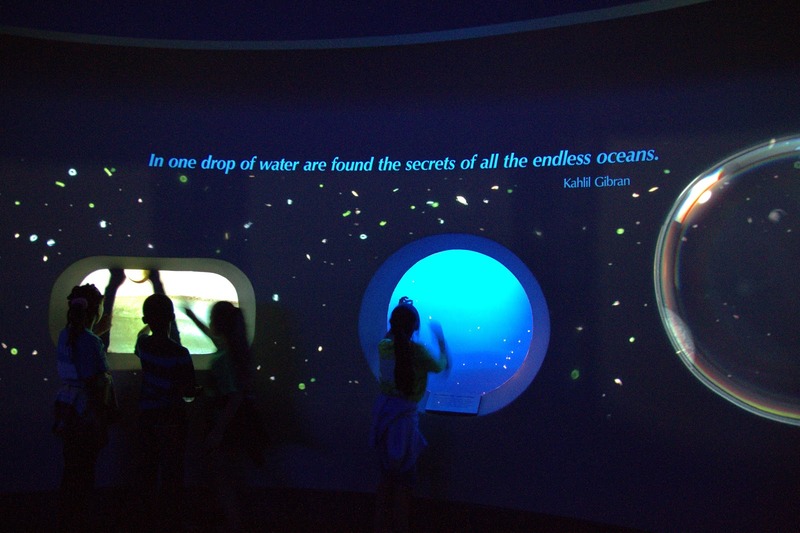 What impressed me the most, was the way the Aquarium presented information about serious environmental issues while remaining positive and hopeful in talking about the future. The question «What can we as consumers do to help?» was always the main focus and answered with great enthusiasm. This constructive and encouraging approach left me, and I am sure many others, with the feeling that what I choose to do, actually makes a difference. Eat sustainably, and spread the word about sustainable food guides (see below). Avoid excessive use of plastic bags, recycle and be really cautious about where you throw items that may cause harm to animals. If you’re in America I highly recommend that check out Seafood Watch. The Seafood Watch program provides an app that helps you choose your seafood dinner well (iPhone and Android). If in Norway, check out WWFs guide, and the blog posts listed below as well as this mobile phone site. (For comments (I appreciate it): “Feeders”, please visit my blog. If you’re already visiting, click the “view comments” link below. Her skal du få en kjapp introduksjon til noen nettsider med informasjon om vanlig norsk sjømat. … Guiden viser til MSC sertifiseringen av sjømat og anbefaler at man ser etter deres symbol når man skal kjøpe fisk og skalldyr.